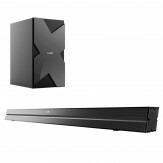 Amazon India selling boAt AAVANTE Bar Wireless Bluetooth Soundbar Speaker with Subwoofer and HDMI ARC (Black) Rs 7999 only which is worth for Rs 11990. You can follow the below steps to buy this product at their deal price..Keep Visiting dealsheaven.in for more Best offers ,hot online deals, promo code, free deals online,free samples, coupons and discount . Sound with 120 Watt rms and subwoofer The boAt AAVNATE bar comes with 120 watt RMS sound with a bassful subwoofer. The sound output feels real, thrilling bass provided by the 60Watt Subwoofer. Upgrade your music listening experience with the boAt Aavante Bar with down-firing subwoofer which provides bold sound to any seat in the room, giving you an audio experience you can truly hear and feel. Sleek Design with premium finish The boAt Aavante Bar boasts of a sleek design with a premium finish to complement the furnishings in your home. Multiple Connectivity Modes : usb, optic, aux, remote The boAt Aavante Bar Supports multiple connection options to provide for a versatile setup. There is USB, Optical, AUX and Remote connectivity options to provide ease of user accessibility and creating 3D stereo surround sound from two channel sources. Adaptable entertainment The sound bar utilizes high end equalizer technology to optimize the sound output according to your source of entertainment and audio needs. There's news, movies, music and 3D modes to create the most appropriate sound profile for the best viewing experience. How to buy Boat BassHeads 900 Wired Headphone with Mic?